Why Won’t the Clintons Just Go Away? They will offer “stories and inspiring anecdotes that shaped their historic careers in public service, while also discussing issues of the day and looking toward the future.” Whose future? Theirs or ours? The Clintons, self-proclaimed champions of the poor and betrodden, apparently prefer tonier crowds. In Philadelphia, for example, ticket prices start at $220 and go as high as $498. This venue has 3,800 seats. Do the math. Of course, they already are everywhere. They “spin” the press and the public endlessly. Both over 70, they can be seen standing next to pop star Christina Aguilera on one of their “date nights.” They travel to Germany and “do Oktoberfest,” Bill wearing Bavarian lederhosen. Hillary appears on prime-time television, on the premier of the new Murphy Brown show and Madam Secretary. And she was giving her counsel about diversity at the “Lesbians Who Tech Summit” conference in New York City last month. How much more can be said about these people? Unlike previous First Families, they refuse to walk off the stage of national life. They believe they deserve to be there, perpetually. Why? What animates their desperation for the spotlight, their insatiable craving — no, demand — for national attention? Clearly, in Hillary’s case, there is the continued humiliation – and deeply-felt rage — of having lost the presidency to a political amateur she despises. Her ongoing explanations for her loss, insistent and almost frantic, have become pathetic. She believes she deserves what she wants. She wants the presidency. Therefore, she should be president. But her desire was also her destiny — the presidency of Hillary Clinton was a matter of timing, not potential. Yet she’s not. How could she not be enraged at being robbed of what was rightfully hers, and hers only? There is another reason the Clintons want all the attention. The Bill and Hillary love the bucks. According to Forbes Magazine, by the time she ran for president in 2016, Hillary alone had a personal net worth of $45 million. 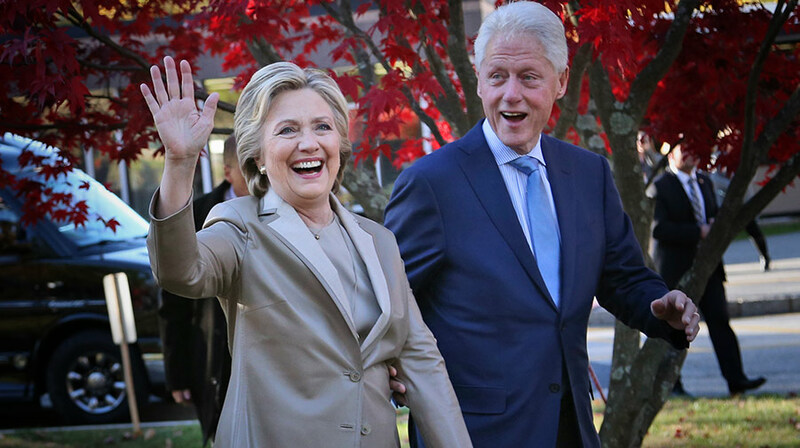 Between the two of them, the Clintons earned $153 million in speaking fees between 2001 and 2015. And on and on and on. Interestingly, Hillary has said often that she is a private person who dislikes attention. She seems to believe that given her gifts and opportunities, she needs to serve. Yet her continuous quest for the nation’s highest leadership posts, including the presidency, betray another desire at work: A craving for praise. In a fascinating article in Psychology Today, author Preston Ni writes of “The Hidden World of Introvert Narcissists.” Using the research of psychiatrist Glen Gabbard, Ni describes persons who prefer quiet, privacy, and a few close friends but who assume a role in order to gain approval. The “true self is submerged in order to perform a role to be admired and/or accepted,” Ni says. Yet in the case of the “introvert narcissist,” that desire is held down by a greater felt need: acclaim. This kind of person “wants to socialize, does so very carefully to be accepted, desists from standing out for fear of disapproval, and regularly behaves in ways that are not herself to avoid rejection.” That, in my view, is a pretty good description of the former First Lady. And why is Hillary now praising the raw and vicious behavior of many Democrats? To wit, “You cannot be civil with a political party [the GOP] that wants to destroy what you stand for, what you care about,” she told CNN. The same reason she always bends to the prevailing political winds: because that’s where the liberal crowd — her people — are going. She cannot be left behind. In that statement, though, Hillary unwittingly admitted what a lot of us have been saying for a long time. Big government is the Democrats’ religion. Unable to radicalize, regulate, and intrude as quickly as they would like, they have relied on the Supreme Court to push-through what they wish. And now, in all likelihood, they won’t be able to. This back-door method of leftist political action is what conservatives wish to “destroy.” And, at any cost, they must be stopped. I fear that the Clintons are so deeply calloused by decades of denials, evasions, and lies that their capacity for dishonesty is only strengthened by the untold numbers of lies they tell themselves. This has suppressed the healthy shame that comes with integrity and decency. As a result, they can say and do whatever they wish, without even a pang of guilt. Christians should pray that as they gradually approach the final years of their lives, the unbending truth of eternity will come home to them. The Bible describes God as “the One to Whom we must give account” (Hebrews 4:13). Unlike the media, a gullible and inattentive public, or anyone else, none of us can spin Him. That’s why Bill and Hillary Clinton, like every one of us, need the forgiveness and eternal life Christ offers. He is able to penetrate the most hardened of hearts. Theirs — and ours, too. Why won’t they go away? They’re jealous of all the attention Obama is getting for himself. One thing the Clinton’s are not is jealous! Yeah, Hillary accepted defeat with quiet dignity and grace. Young Frankenstein reference for the win. I would say Trump and Frankenstein are the same guy! big goofy ugly and dumb! Yep; they just hire out the revenge and keep those stupid grins right on the old (OLD) mugs. Speaking of old mugs just look in the mirror to see one old mug! Kind of like feeding the pigeons. Like Reagan kept on making speeches and so does Bush, They should follow the extraordinary path of President Carter! There’s a big difference between making speeches and seeking the spotlight. Hillary is pretty clearly seeking the spotlight. Your troll attempt has failed. My troll was a success as you limp dicked conservative responded as you always do, so much fun to take you to the wood shed! They don’t have to go away, Reagan kept himself in the spotlight (even though he could not see the light) and made millions off of speeches!!! In answer to the headline question: because they refuse to return the Ark to the Israelites.